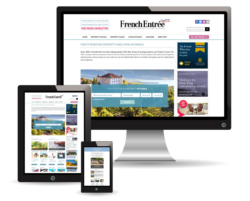 FRENCHENTRÉE MAGAZINE: What brought you to this part of France? CLAIRE BERNARD: After the arrival of our second baby in 2004, we were living in Geneva because of my husband Andrew’s work. But he was finding his job too stressful and I didn’t feel that at home there so we decided on a change of life. We sold up and started searching for where we thought would be the ideal place to live. Even though we missed our London life, our daughters, Jasmin and Lily, were starting to speak French and we thought it would be a shame if we went back to the UK as they’d forget all they’d learned. Coming from Cornwall, I missed the sea and yearned for a natural and wild coastline – it had to be the Atlantic! – so we started looking in Biarritz. After a fruitless search in the south-west we journeyed up the coast and it wasn’t until we arrived in Finistère that I felt instantly at home. Everything from the colour of the greenery – yes, and more rainfall – to the friendliness of the people felt right. Andrew had dreams of something with a tower and, by chance, we found a small pretty château on the outskirts of Quimper. It was a moment of folly as we visited it for an hour and then decided to buy. The château didn’t need any major renovations but had a gîte in the grounds, which naturally we renovated and started to let out. FE: Did you have any renovation or design experience before you came to France? CB: Andrew and I bought and renovated our first flat in the UK when we started our first jobs after we graduated in 1993. It was by necessity rather than choice as it was a property that hadn’t been touched for 40 years and, having stretched ourselves to buy it, we had no budget for renovations. We worked every evening after work and weekends over five years and did everything ourselves, learning DIY from the Reader’s Digest manual! There were quite a few tears but we were very proud of ourselves when it was finished. When I got pregnant with my first child we stepped up to a house. Again, it was the ‘sad one’ nobody wanted and it needed a complete overhaul. That time, we were able to get builders in, who took down walls and windows while we lived in one small room with a baby. But we still did a lot of the decorating and made the choices ourselves, and the satisfaction of turning an ugly duckling into something beautiful got me hooked. When we moved to Geneva, I had to give up my job and found it hard to not have a project, so we found a run-down chalet in the French Alps. Again, we did a lot of the work and, as well as using it at weekends, rented it out during the ski season. We also bought and did up a house outside Geneva. When we moved to France, we hadn’t thought very much about what we’d do. We needed an activity of some sort to become part of the French system. The gîte rented out well and, with our past experience, it made sense to look for another project. The housing market was still buoyant and there was a choice of lovely properties which we thought would make good investments. While we’d been property hunting, we had stayed in some local gîtes and been surprised at the lack of anything comfortable on offer and how difficult it was to find somewhere that we actually wanted to stay in. Also the shock at the end of your stay, when you’re presented with bills for water, electricity, sheets and towels, and feeling slightly humiliated when the gîtes’s inspected to see if you’ve removed every last crumb and cobweb. With Andrew’s job we’d been fortunate enough to stay in some lovely hotels and decided that we wanted to recreate this feeling in our holiday houses and go for the high end of the market. Wherever we can, we’ve used high-quality materials and equipment, and we wouldn’t put anything in our houses that we don’t love ourselves. We try really hard to make sure our houses are places we’d be excited stay and that when you arrive, feeling tired and maybe stressed, you’re pleasantly surprised by what you find and it’s even better than the photos. FE: What were you looking for when you bought Ty Bili, your property in Finistère? CB: We were looking for a house by the sea, in an unspoilt area. The Cap Sizun is a little like Land’s End – it’s remained locked in the past and is still very quiet and rural, with some incredible coastline and lovely uncrowded beaches. The property was an old farm and when we bought it. Ty Traez was the main house, built in 1911, and this neighbouring property, Ty Bili, was an old Breton stone longère which had fallen to ruin. Ty Bili has the date 1836 and the names of the original owners inscribed above the door, and is the oldest house in the village. When the big house was built next door, it ended up being used as stables. The whole farm was owned by the most important landowner in the area but he emigrated to Canada. Ty Bili sits in a large, pretty garden surrounded by stone walls and looks out over the garden and fields to the sea. It isn’t overlooked and is only 300m from a creek and the coastal path. You can’t see the sea but you can hear it. The area is wild and natural, and the cliffs reminded me of Cornwall. The main house, Ty Traez, was solid but needed a full makeover – bathrooms, kitchen, decorating – so we did that first. Initially, being exotic and English, it was very hard to get any artisans to work on the property – either we got silly quotes (€20,000 for a small bathroom) or none at all. It was so frustrating that we ended up doing nearly all the work ourselves, apart from essential plumbing and electrics. We renovated it over the winter and rented it out for the following summer. We didn’t renovate Ty Bili until a few years later. It was literally a roof and the stone walls. Inside, there was only the big stone fireplace and bread oven, and the floors were dirt. FE: What’s your approach to renovation? CB: Initially, I’m very much inspired by the character of the house, and pay close attention to the original architectural detail. I then like to use colour on the walls, to give a feeling of continuity and flow, and make the most of the natural light. I’m very influenced by nature and the natural landscape and, without consciously thinking about it, the surrounding colours find their way into the houses. But otherwise there’s no formula, each house is its own personal project. 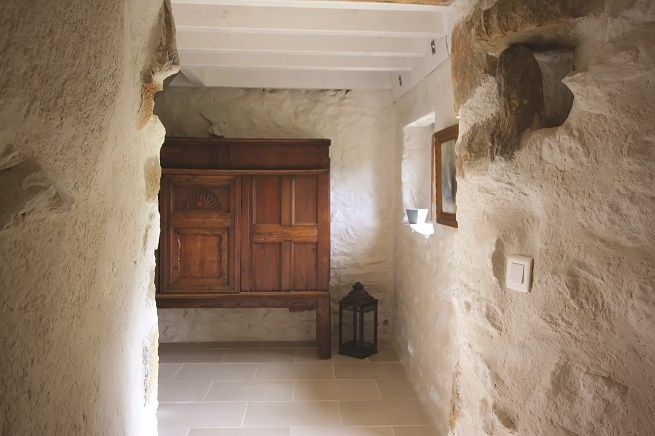 However, we always aim to keep as many of the original features as possible – stone walls, fireplaces, etc – and then use high quality and natural materials. In Ty Bili, the whole of the ground floor is limestone flagstones. 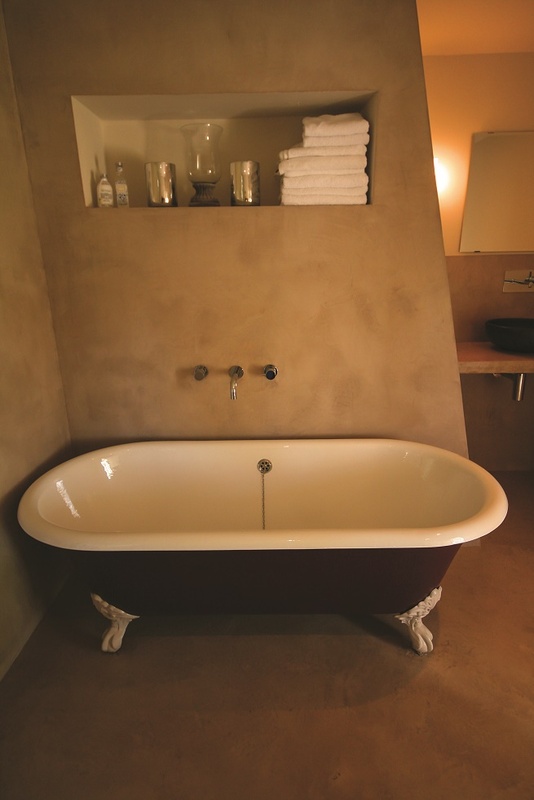 The ground-floor walls are covered in lime plaster (chaux), which is a natural product that lets the walls breathe. The external joints in the stone are done in the same way. We put a Charnwood wood-burner in the huge fireplace in the living room – it can heat the whole living / kitchen area – and then we have an electric heatpump and radiators as backup. The ceiling joists and wooden staircase were painted, to keep it light and airy, and we put plate glass doors in, to let in as much light as possible. I’m really pleased with the bathrooms and shower rooms. The walls are done in a smooth, decorative concrete. This looks and feels really nice, and is easy to keep clean. The shower tray was honed from a local stone mason, out of a solid piece, and I used an old sewing machine table for the sink in the shower room. The bath is a cast iron ‘roll top’ that we bought over from England. 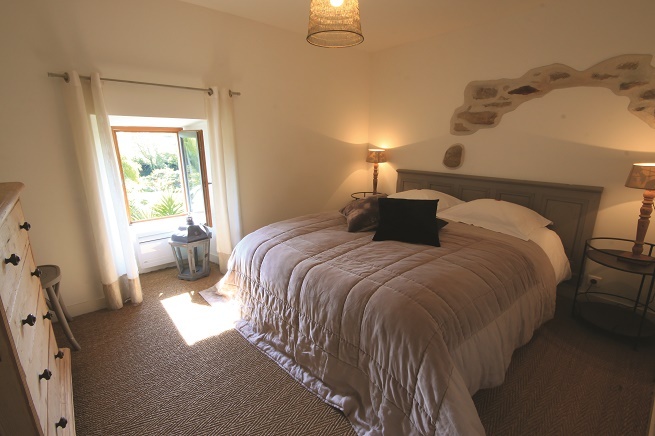 The bedrooms are quite simple with jute flooring. The headboard in the master bedroom was a wooden panel from the château, which we painted. The walls are Farrow & Ball, and all the attention went on the beds, which are comfortable with Egyptian white cotton bedding and throws. Generally, I aim to keep rooms calm and neutral so they feel clean and fresh, and then add unusual pieces for interest. I’m strict about building up a room by keeping it simple and not trying to make too many statements. Interesting details can be added at the end. These can be made, found or bought in small shops. The important things, like beds, sofas and kitchen appliances, are bought in regular shops, always with an emphasis on quality. But generally I try and avoid mass produced furniture and furnishings – the more interesting pieces come from antique shops and ‘troc’ or junk shops. I prefer finding funny pieces of old and outdated furniture, and then painting them. I can’t stop myself spending hours going around big, cold and draughty hangars, looking for some unusual piece of junk to bring home and renovate. I have to admit to sometimes having found the table first, then have to go and find the house to put it in! Then are some specific ‘deco’ items – like vintage rugs, lamps and lighting and nice pieces of furniture – that come from decoration boutiques. My favourite of those are L’Art et La Bannière in Audierne and La Pastorale in Quimper [no website: 6 Rue Saint- François, 29000 Quimper. +33 (0)2 98 95 89 66]. I also seem to collect fabric and am forever making cushions, and Andrew likes to make wooden sculptures from fallen trees at home and some of those have found their way into our houses. Andrew is also the one who’s interested in all of the technical parts – the heating, lighting, stereos, TVs, taps, etc – so I leave that to him, as well as the more unsavoury things, such as drains. He is also very handy at the smaller jobs, and drilling and fixing things in place. We also like to use local artisans wherever possible and we’ve now built up a very good team of local plumbers and woodworkers, although I still do a lot of the painting. FE: Did you face any particular challenges transforming Ty Bili? CB: We have now renovated 11 properties but this was one of our biggest challenges. The building company we initially took on were young, enthusiastic and new to the area, from Paris. They were recommended to us by an artisan friend and insisted that they could do everything, from building to plumbing to woodwork, and would hand us over the keys to a finished house. It all sounded too easy. Three months in and, after handing over a significant part of the budget, we realised that everything had been started but that it wasn’t going any further and that it was way off-plan. With guests booked in for the coming season, we had to call in the services of our trusted artisans from previous renovations, who came to the rescue. So we had to redo everything and pay twice. We lost a lot of sleep and worked all hours to get the house finished – our daughters got a puppy as compensation! So this house was our biggest nightmare renovation, but it’s actually the one we’re the most pleased with. It was also enough of a nightmare to calm us down, and I was actually forbidden by Andrew to take on any more projects. Now I do art classes, and Andrew cycles! 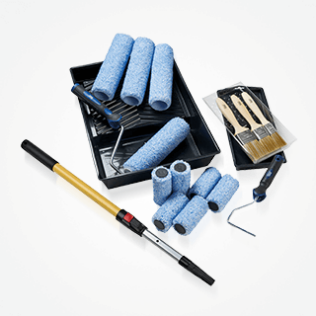 FE: What renovation and decorating tips would you give others who wanted to follow in your footsteps? CB: In general, we have found the local artisans to be possibly more expensive – initially, at least – than in the UK. But when they give you a quote, they stick to it and we’ve never paid a Euro over. They are also very competent and professional. The difficulty always is in finding the good ones and then getting them to quote and actually give you a start date. You need to think ahead and be persistent. It’s always important to get the basics right. If the architectural details on a house are beautifully finished off, you can get away with very simple decoration – it’ll always look good. Also, you can’t really go wrong with natural materials.